Lingaa is the new movie of our superstar Directed by KS Ravikumar thalaivar movie released after 4 years on thalaivar birthday is big feast for superstar fans , the movie storyline is about Raja Lingeshwara, his efforts and sacrifice to build a dam, which will be beneficial for 10 generations. The movie started in a good manner showing the present situation of dam and gave intro to few villains. The dam-checker dies requesting to open the closed temple. And, the village head urges that, only the grandson of Raja Lingeshwara should open the temple, as it was built by him. And, there comes Linga(Rajnikanth), understands the greatness of his Grandpa, Raja Lingeshwara(Again Rajnikanth) and protects the dam from villains. 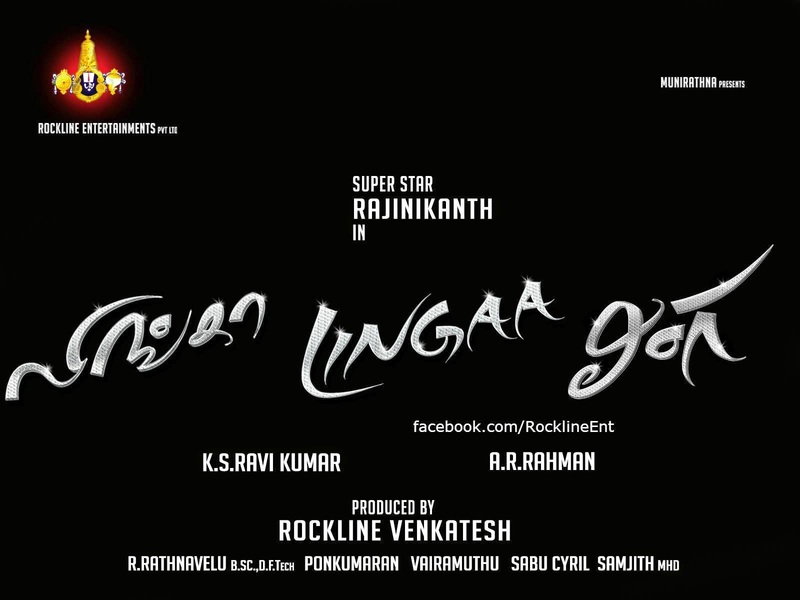 The story line has nothing great in it, but presentation in an engaging manner makes Lingaa watchable. The comedy track by Rajni sir and Santhanam with Anushka kept the first half engaging. Those comedy scenes were also funny. Those flash back scenes, in the pre-independence period, were near class with a good amount of mass content in it. Once those flash back scenes end, the movie enters into suspensed mode eventually leading to a unexpected climax. Coming to performances, Rajinikanth is the life of the film. The movie required a superstar for the role of lingaa and Rajini sir was perfect. He kept the screen on fire as Raja Lingeshwara. He looked young at 64 but unexpectedly with unmatchable screen-presence, mass dialogues, action sequences and dance moves, everything in Rajni sir style. Santhanam took charge over the comedy track he is coming mostly with Lingaa character and made us to laugh all the time. Coming to the heroines, Sonakshi Sinha had a rather important role than Anushka shetty and she did justice to her role. The one who acted as British Collector was also good. Dev Gill's good man role seemed novel. Jagapathy Babu did his part very well. Rest of the supporting cast did their usual jobs. Brief appearance of Brahmanandam was too crappy to be enjoyed. Coming to the making side… KS Ravikumar sir didn't do justice to his job completely. I felt that, his concentration was fully on the flash- back part and left the other parts loose both flashback and present lacked somewhere. A better script in those ending parts would have made Lingaa memorable. His direction seemed good but not to his extreme best. Technically the movie didn't seem that Hifi. Songs were good and Pon Kumaran's story was good enough to build a decent script, but KSR lagging in scripting into the end portions. How can one jump from bike to a parachute, then roll over it with a rope, fight with the villain, kill him, rescue the heroine from falling and kick-away the bomb into the dam that too all these in a span of less than 3 minutes….!!! May be we accept it because for Superstar but it felt too funny to enjoy. Coming to the technical side, Music by AR Rahman was good. BGM was of top class but seemed normal at certain scenes. Songs could have been better, only a couple of them were good. Choreography of 'En Mannava' song was awesome. Editing wasn't crisp, certain portions could've been trimmed off. Action sequences in that Train Fight was of top class. Visual effects didn't seem that realistic except for a few shots in the train fight and dam building scenes. VFX in Gasolina song wasn't that fine. Camera work was of good quality. Kudos to Ratnavelu. Overall, Lingaa adjusts itself to an GOOD but not upto compared to his ROBO movie without offering anything new. Watch the film for impeccable screen presence of Superstar and those energetic flash back scenes. It will be a good feast entertainment for superstar fans.